This exercise is a good test to know if the rider is equally effective whatever her position: seated or forward seat. The goal is to get the horse to keep the same canter rhythm and the same pushing power, especially in the turns as horses have a tendency to decrease their impulsion in the turns. We explained in the previous lessons how important it is to allow the horse to move freely especially in his back. 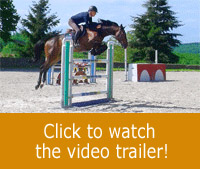 As a result, it is best to be in a jumping position to allow the free flow of energy along the top line and to encourage the horse to engage his hind legs. The better the horse’s pushing power, especially in the turns, the easier it is for the rider to slow down, speed up, or modify the length of the stride to approach the fence in good form. In general, when riding in a seated position, riders may have the feeling of being stronger, more secure and that their aids are more effective. However, to seat heavily in the saddle, pushing down on the back of the horse, works against the forward movement. 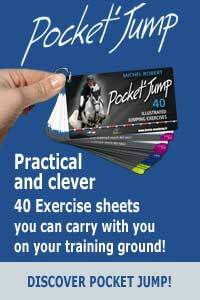 Rider should be able to ride and remain as effective in a 3-point position as they are in a 2 point position. To switch from one position to the other one, should not generate any stiffness or blockage, as it will have a negative impact on the pushing power and balance of the horse, as well as on the rider’s ability to stay on a precise track. The more fluid and light the rider is in his movements, the steadier the horse will be in his canter….This is today’s focus. This exercise refers to the sheet H9 of the Training 1 program. Lucile rides her mare Vanille to demonstrate the exercise. As she starts the exercise, she realises that it is more challenging than expected. Vanille is not a very reactive mare and to turn short makes her lose the impulsion which causes her to break into a trot. The goal will be to keep the same rhythm over the entire track, especially before, over and after the flexi jump ground poles.